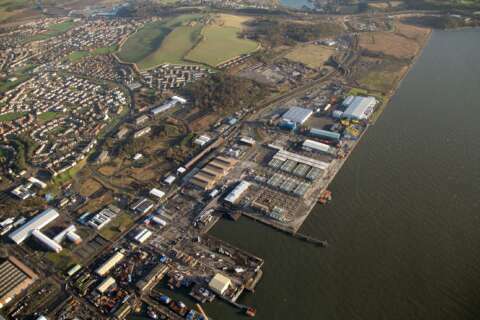 The Port of Rosyth is ideally located within the Forth Estuary on the East Coast of Scotland for connections to Europe and beyond. Rosyth is an important fabrication base for the energy sector. Amongst others, the port hosts Oceaneering, a global business which supplies high value umbilical cables to the offshore industry. The facility at Rosyth has recently carried out the largest spooling operation in the world onto the 7000 tonne carousel on the Maersk Connector. The presence of this firm means that Rosyth is an important calling point for subsea vessels. The port has also recently undergone a significant expansion to its quayside load bearing capacity to accommodate work associated with the new Queensferry Crossing. Rosyth was the construction port for the project which lasted 5 years. A large section of the port was cleared to provide project space for the Queensferry Crossing Construction. This has created 16 acres of space directly behind the quayside to support the port operations. There is further demolition work planned and a new crane PAD being created along T berth. This will add to the flexibility this busy port has to offer.